Museo Silver Rag, with a first-of-its-kind coating and 100% cotton furnish to bring out the best in B&W and color images with a traditional photo paper look and feel. Portfolio Rag which combines an extra smooth cotton base with advanced coating for museum exhibition and portfolio prints that require exceptional tonal range. Museo MAX featuring a luxurious finish optimized for pigmented inks and is ideal for art reproductions, color and B&W printing, portraits, graphics, and sepia prints. Museo Textured Rag has its cold press watercolor surface enhanced with an ink receptive layer that allows for the most vivid images possible. It is ideal for art reproductions, fine art photo printing, digital art, exhibition prints, and portraits. Box Dimensions (LxWxH) 11.4 x 9.0 x 0.75"
Fine Art Sample Pack (8.5 x 11", 12 Sheets) is rated 4.8 out of 5 by 4. Rated 5 out of 5 by Bob from Nice Paper About the same saturation characteristics as Canson paper but with much better contrast and color depth. Contrast nd color depth very similar to MOAB Entrada but with better saturation characteristics. Rated 5 out of 5 by Anonymous from Sample pack of quality papers If you want to get a feel for the different papers Museo offers, this is the best way. Three sheets of each paper means one for a test print and two to print color targets for profiling! Great! Rated 5 out of 5 by abuford from Great Deal I wanted to try the Silver Rag but did not to buy a whole box and then find I did not like it. 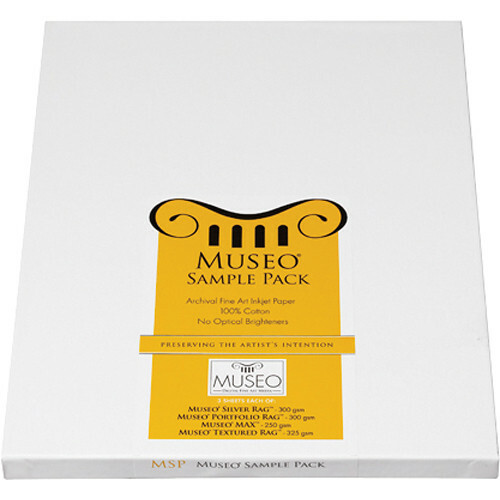 This is a terrific and inexpensive way to try out some really special Museo papers. Rated 4 out of 5 by Thomas W from PAPER CHASE WITH ALL THE PAPER ON THE MARKET A SAMPLE PACK IS A GREAT IDEA. YOU CAN TEST THE WATERS AND FIND SOMETHING TO YOUR LIKING.